The jungle backed beach towns that comprise Nosara have been enchanting travelers for decades with their gorgeous scenery, warm weather, and big swells. Many come, decide to buy property, and never leave. As a result, Nosara has a strong expat community with many international influences and Western comforts like organic food, Italian restaurants, yoga studios, high quality international schools, and plenty of activities for people of all ages. Nosara consists of five beach towns and one town center that lies five miles inland. All of the towns remain quiet and relaxed but have restaurants, bars, hotels, vacation rentals, hotels, and luxury homes. Most people live and stay in either Playa Guiones, Playa Garza, or Playa Pelada. Playa Guiones is the most popular town among both tourists and expats. Playa Guiones stretches for three miles. 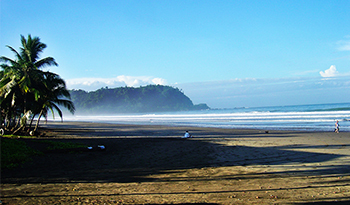 Surfer’s love Playa Guiones as it has the most consistent surf in all of Costa Rica and offers waves for all experience levels. Yoga, pilates, and massage centers abound, as well as thriving expat-owned cafes and restaurants. The town has a few small grocery stores. Most of the budget hostels and hotels are in Playa Guiones, as well as the luxury Harmony Hotel. 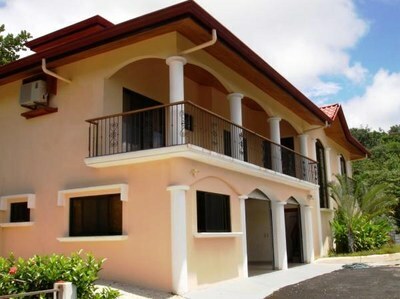 There are oceanview rentals and homes located in the hills behind Playa Guiones and only a short walk from the beach. Playa Garza is a quiet, quaint fishing village. Tourists and restaurant owners come to the bay to purchase fresh fish right off the boat. A few expat-owned restaurants are scattered throughout the town, along with some simple local cafes. Playa Pelada, which neighbors Playa Nosara, has a small town and is an excellent beach for swimming. Divers and snorkelers can boat out with locals to see dolphins, turtles, and even whales. Playa Nosara is a uniquely black sand beach which sits on the Nosara Biological Reserve, along with two of Costa Rica’s longest rivers: the Montana and the Nosara. Consequently, Playa Nosara is full of wildlife and makes a great place for kayaking and stand up paddleboarding tours. It is possible to observe many species of birds, monkeys, and even crocodiles here. Playa Ostitional is where the Olive Ridley Sea Turtle come to nest each year, and is protected by the Ostitional Wildlife Refuge. Hundreds of thousands of turtles nest here on the darkest nights following the full moon. Volunteers come to assist when the baby turtles hatch and run back out into the sea. The town center of Nosara is five miles inland and consists of a predominantly Tico population. General necessities like medical facilities, supermarkets, a local airport, pharmacies, banks, and a post office can be found here. It’s also a great place to hear traditional local music and to dance with locals.